The IPO Awards are presented to former pupils of state schools who achieve national or international prominence in their chosen field. IPO stands for Is Proud Of. Place the name of your school, town, city or region in front, and you’ll get the idea. 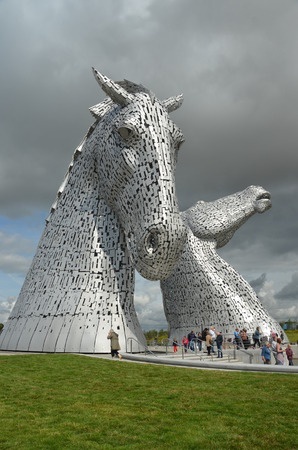 Our first IPO was awarded to the figurative sculptor Andy Scott whose most famous work is The Kelpies – two remarkable 30-metre high horse-head sculptures in central Scotland. 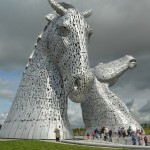 They are the tallest equine structures in the world. Andy was educated at Bellahouston Academy in Glasgow so we teamed up with the Education department of Glasgow City Council to host a special event in the wonderful City Chambers where a talented Bellahouston pupil presented Andy with the trophy shown above. 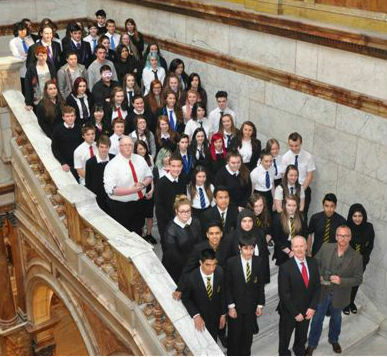 Afterwards, Andy spoke to 50 top students from the Art & Design departments of Glasgow’s state secondary schools about his art, his career and his love of his home city.